Oakland, Calif. – March 14, 2018: Tall Ships are sailing back into port at Jack London Square Friday. Lady Washington and Hawaiian Chieftain will berth at the foot of Broadway and be open to the public beginning Saturday for on-dock tours and weekend sailing adventures. The sailing ships provide a peek at maritime trade and transportation history from the mid-1700s to the late 1800s. Visitors can board the Tall Ships through March 25. Dockside tours are available for a suggested $5 donation. Ticketed sailing adventures and simulated battles on the San Francisco Bay provide a step back in time to what maritime activities were like hundreds of years ago when sailors risked their lives on the world’s oceans to move goods and people across the seas. Built of steel in Hawaii in 1988 and originally designed for cargo trade among the Hawaiian Islands, the Hawaiian Chieftain is a replica of the Atlantic coastal sailing vessels in the second half of the 1800s. She is a fast topsail ketch that has visited Tahiti, the Atlantic Ocean, and once sailed out of Sausalito, Calif.
Lady Washington is a present day reminder of the first American vessel to make landfall on the West Coast of North America in 1788. Lady Washington has appeared in several movies and television shows, including Pirates of the Caribbean: The Curse of the Black Pearl, Star Trek: Generations, and Once Upon A Time. For all Jack London Square special events please click here. The tall ships are part of the Grays Harbor Historical Seaport Authority (GHHSA) and the ship’s crew provides a variety of hands-on educational experiences. 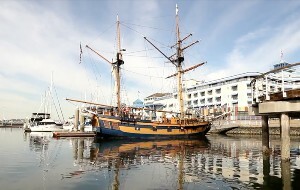 For more information on public tours and sailing schedules, please go to http://historicalseaport.org.